Still retaining much of the vivid color of its silk threads, this sampler worked by ten-year-old Anna Sanders is one of three known from Warren, Rhode Island, each signed and dated by a young girl between 1793 and 1803. 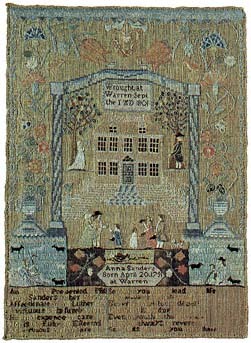 Related compositionally to samplers made in Providence and Newport, all three Warren examples depict a central motif of a Georgian-style house with raised steps, flanked by two trees; a group of conversing figures worked in profile- perhaps a family- stands at the bottom of the scene, which is enframed by striped columns supporting an arch. Genealogical study of the families of the three girls in Warren reveals that they were taught by the same schoolmistress, who had moved to the town from Newport during the Revolution, her teaching career spanning a quarter century. It was probably she who passed along to her pupils the basic design of the samplers, perhaps by adapting motifs from print sources. The inscription Anna Sanders worked at the bottom includes an acrostic verse in which the first letter of each line spells out the young maker's name.